Metering refers to the measuremtent of resource consumption, particularly for electricity, gas and water. Most residential dwellings have individual electricity and water meters, and where town-gas is available, a gas meter. The popularity of metering data stems from its ability to provide a quantitative measure, which conforms to the adage “that you can’t manage what you can’t measure”. Metering provides consumption data that can be collected at various points in time, such as before a project commences, and after the implementation phase, thereby providing a before-after comparison which can be analysed statistically. The idea behind the collection of metering data is to monitor changes in resource use, and evaluate the behaviour change project’s impact. Before and after data comparisons should only be only be made for comparable seasons in order to avoid seasonal variations. Even when comparing between the same seasons, it may be worth noting the average climactic indices (eg. temperature, rainfall) in order to factor in environmental factors that may affect household resource consumption, such as prolonged cold or hot weather, and rainfall (which may impact on outdoor water use, or water collected in tanks etc). Metering data can be obtained from various sources. These are described below, along with their pros and cons. 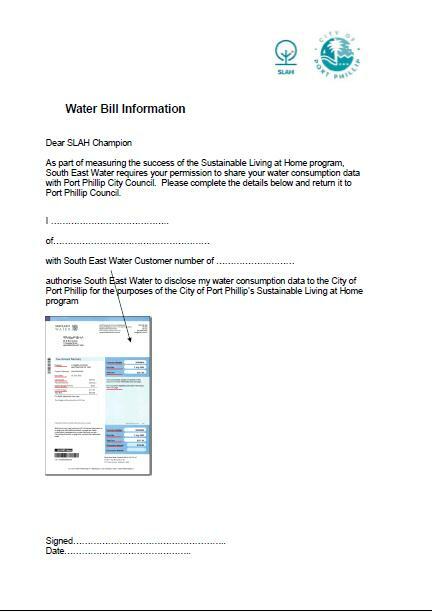 In Australia, behaviour change projects frequently seek to obtain billing data from participants to provide metering measurements. Energy (electricity and gas) and water utilities generally provide quarterly metering bills. This means that data collection intervals for your project may not match the billing period. All participants in an intervention do not necessarily receive bills at the same time, so data input and analysis can be difficult. Collecting billing data can also be difficult, and experience from projects in Australia reveals a certain level of unwillingness by participants to disclose billing data to an external party. 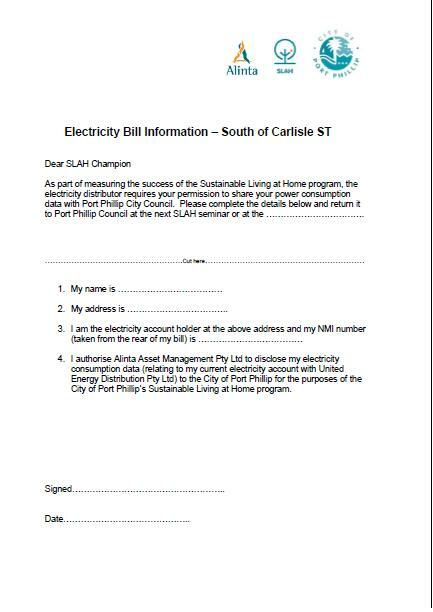 Ways to overcome this include the option for participants to sign a consent form for the utility to release billing data, or the use of an incentive (such as the chance to win a solar panel system) to get people to provide data. Billing data can be entered into spreadsheet programs such as Excel or SPSS or into specialised databases such as Utility Tracker. As the Australian energy retail market is deregulated, the collection of data can be hindered by households changing energy retailers. Energy bills are generally issued by the retailer, but the actual meter reading and data collection is done by the distributor. (You can learn more about distributors here.) There is generally one energy distributor for an area, so they will also have historical data for the households. Therefore, one option is to look into the possibility of obtaining release forms/consent forms from target households so that the distributor can provide meter data. Where projects have used consent forms for utilities, it has been found that utilities may not be cooperative, or timely in the release of accurate data. As such, it is recommended that you enter into discussions with the distributor at an early stage in order to develop the required consent framework. Billing data can also be inaccurate, in that bills can have an “estimated” reading as opposed to an “actual” or correct reading. This type of inaccuracy can occur whether the data is provided by the retailer or the distributor. Energy meters are only required to be physically read once a year. You could get participants, or another party, to collect metering data as a complement or an alternative to collecting bills. For more information on how to read meters, click here. Smart Meters are being rolled out across Victoria in an initiative that will provide two-way remote communication between electricity meters and distributors. This should provide for more accurate and timely consumption data, as electricity use will be read every 30 minutes. Smart meters will also assist in providing more accurate electricity use profiles which can be used for evaluation purposes- for example, seeing if there are changes in use at particular times of day, from particular behaviours (such as turning off standby power). Another benefit of smart meters is that they provide the opportunity or households to monitor their electricity use through in-house displays or websites. Accessing smart meter data may face similar constraints as billing data in terms of obtaining consent forms from householders, as well as the cooperation of the distributor. It is recommended that project staff consult with electricity distributors at the early stages of any project. Several large scale electricity reduction and load-shifting projects are using smart metering. For example, the Magnetic Island Solar Suburb (part of Townsville Solar City) project is using smart meters to evaluate participating households electricity consumption profiles. 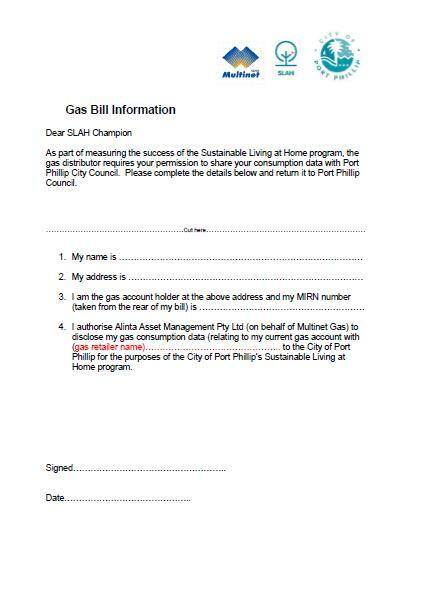 The Zero Carbon Moreland are using smart meters in a small sample of households to complement the collection of billing data. A particular constraint about metering data, whether it is gross, quarterly billing, or even half-hourly measures from smart meters, is that it fails to provide information as to where electricity is being used. This is of particular concern where behaviour change interventions target a number of varied behaviours across a household (such as switching off lights, reducing standby power, reducing the hot-water temperature, installing insulation etc). In such cases, if a measurable change is recorded through metering, it is not possible to know whether the change is brought about by the desired behaviours, or other actions. Also, it is not possible to know whether a change is a result of a single behaviour, or numerous ones. The converse can also occur, where metering data shows no change, but participants indicate through other evaluation methods (namely qualitative) that they feel they have changed behaviour. In-line metering refers to the monitoring of specific circuits (electricity) or pipes (water) that allows for accurate consumption data for particular appliances of fittings. This overcomes many of the constraints outlined previously about guessing or assuming where savings are made. The main constraint from in-line metering is the cost associated with installing the data logging equipment. As such, in-line metering may be more suited to larger projects where a small sample may have in-line metering to complement other methods such as smart metering. A small sample of in-line metering may provide a snapshot as to where savings are being made, and this can be extrapolated to the larger sample. There is a guidebook available, produced by the Institute of Sustainable Futures (University of Technology Sydney) and the CSIRO on how to conduct in-line metering for residential water. There is continuing research and development in smart meter technology but in-line metering is not likely to be commonly available in the near future, without extensive rewiring of households. If you have a monitoring and evaluation plan in place, you will be able to collect baseline data and then collect further measurements during and/or after you have implemented your behaviour change intervention. In such cases, you can use a paired T-test to analyse the data. For those with a background in the natural sciences, this fits the BACI (Before-After-Control-Impact) design. The BACI is considered to also work well for behaviour change projects, as it provides an evaluation design to identify broader resource consumption trends that may be occurring in the wider community. For example, with a simple Before-After design, you may notice a change in resource use that you attribute to your intervention. With A BACI design, the Before-After in the control group (where there is no intervention) may also change in the same direction as your intervention. In this case, the change between the intervention and that of the control would need to be statistically significant if you wanted to have any confidence in attributing it to the intervention. You can use an Analysis of Variance (ANOVA) .